From the team that brought you the Pokémon games comes an original franchise catering to gamers' passion for the rhythm game genre. What sets Game Freak's new title apart from other games in the genre? Does the music make you jump for joy, and what about the platformer action? HarmoKnight is a rhythm based platformer that implements the 'automatic running to the right' game mechanic found in other games like BIT.TRIP Runner. 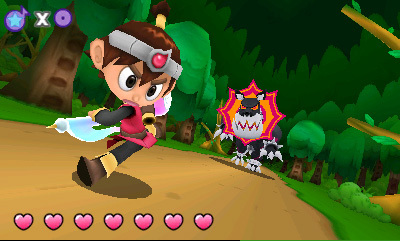 The hero of the game, Tempo, runs along, collecting floating music notes and attacking enemies at the right time following the rhythm of the game music. Said enemies will drop more music notes, because that's really what you're shooting for in this game: collect as many notes as you can within each stage. Think of it as your score. Whack! Need more notes, MORE! So yeah, just jumping and attacking. But… there's more to it than just that! Each stage has a number of different paths you can take, such as if you want to take the low road, or perhaps decide to be more adventurous and jump to some higher platforms where you may be rewarded with a larger number of music notes. Adding to the mix are additional opportunities for music note collecting. 'Percussiplants' (plants in the background containing different instrument shapes) are strategically placed along your path and can be tricky to hit correctly for additional notes, especially the ones that you have to jump and hit to reach. 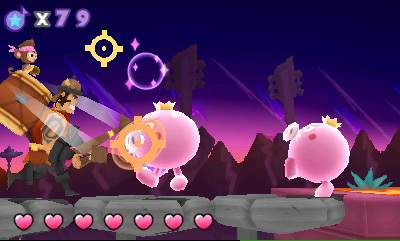 In general, a myriad of opportunities for a high score results in stages that are cleverly designed; stages can be easy for novices who are only focused on grabbing the visible notes and attacking enemies, or they can be challenging for experts who want to maximize their note count by hitting all the sweet spots. Beginners need not worry: the game seems fairly generous in its minimum note count threshold for getting the 'Royal Note' (earned by hitting a certain number of notes, though it never really tells you what that number is). As long as you are hitting most notes and staying alive, it's not too difficult to complete a stage. On top of that, slight variations of the basic Tempo stages get thrown into the mix that do a good job of spicing things up a bit, from different playable characters to vehicle stages, and perhaps most satisfying of all, boss battles. You can't go wrong with a monkey sidekick, no sir! Boss battles are their own stages and can feature a greater range of button inputs. Essentially, you're given different patterns to 'memorize', (left, left, attack, jump, etc.) which you then have to pull off to the same beat. The camera automatically swivels around the action with dramatic flair as Tempo and his foes(s) exchange heated 'musical' combat, resulting in encounters that are very satisfying to pull off. Boss fight! Watch your back young warrior. What this all boils down to is that the game doesn't get too repetitive since there's always something to look forward to as you make your way across the land. I rarely encountered any dull moments! In general, the normal story mode is not overly difficult, especially when compared to something like the BIT.TRIP series. This isn't necessarily a bad thing. To help ease the players into completing stages, you're given a fair amount of margin for error in your timing so that you don't always have to be so precise. You can also accumulate quite a bit of health with heart pick-ups, since they simply add on to your existing meter, thereby increasing your max for that stage if you didn't get hit in the first place. (You can still die instantly by falling into pits regardless of health, and there are no checkpoints). Game too easy for you then? This game still delivers a harder challenge in several ways. First of all, any stage can be played on Fast Mode. As trivial as it may seem to simply increase the speed, Fast Mode really does keep you on your toes and can change the way you view any particular stage. There's also a hidden secret world comprised of long expert stages (which can also be played on Fast Mode!). All in all, there's plenty to keep you going, even if, personally, I did not feel too challenged for the first hour or so. 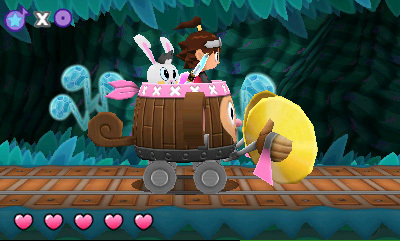 I have to mention the bonus stages are delightful! It's Game Freak, so you surely know what game's music is used: Pokémon. I just wish there were more of them and were a bit longer. There's even a few Pokémon visuals in the environments thrown in for good measure. The visuals in the game are vivid, colorful, and represented very well in stereoscopic 3D. Mine cart stages and boss battles, in particular, have some very strong and excellent use of depth with the 3D screen. Overall, the presentation of the game is very lighthearted and cheerful, with some funny (and cute) facial expressions from the characters, especially when they achieve victory of some sort. This game is perfect when you just need a smile, as long as you're not playing on a difficulty level that has you yelling in frustration! Oh, did I mention there's a story? It's somewhat... forgettable. Your main character, Tempo, is a warrior-in-training living in the world of Melodia, a world entirely driven and consisting of musical elements, from the plants to the clouds in the skies, to the inhabitants. Everywhere you look, music note shapes abound as far as the eye can see. It may seem a bit much, but it's all part of the game's allure, so I'll forgive it a bit. 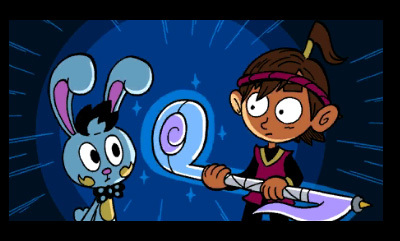 Melodia comes under attack by the Noizoids (noise is their weapon obviously), and Tempo finds a magical staff that he must deliver though he learns to wield its power as he journeys along. Small cutscenes don't detract too much, but it does get a little annoying when text conversation pops up between stages between the different characters and start to drag on a bit longer than they should, especially when you just want to jump into the next stage. Behold the power of... this thing, my little bunny friend! 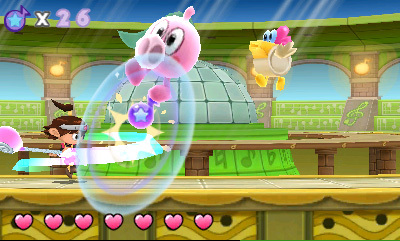 The question players will have regarding a rhythm-based game is whether the music in the game successfully meshes with the character's (and player's) actions. For the most part, this game handles it quite well! The music is not always terribly catchy but I enjoyed most of the music tracks, and the game has a lot of fun with the main theme by mixing up the music types among each of the different worlds. You'll get a nice mix of music genres, including classical music, jazz, calypso and marching band themes, as well as some rock music, which fit well with the tone of the fantasy game world. Your characters' actions feel very natural, smooth, and responsive, an important feat for a rhythm game to have. As previously mentioned, you earn a Royal Note on each stage if you collect enough regular notes. You'll need a minimum number of these to continue your adventure at certain points. If you don't have enough, simply go back and try stages again. One nice feature I came to appreciate is that any time on the map view, you can simply enter your menu and select any visited stage to try again (without having to navigate across the world map). Also, on the Stage Selector you can just listen to the stage's music if you so desire. Simple touches like these are very welcome indeed. Overall, the main story mode won't take but 3-5 hours to complete, so the game seems a bit short on the first playthrough. However, the Fast Mode feature and unlockable expert stages ensure you will be adding at least a few more hours to your play time. The $15 (U.S.) price tag is a little bit on the high side, but personally I found the content was quite satisfactory. There's a free demo on the eShop that does a great job of showing off the game's key features; check it out! I played the demo back when it released, and I was pretty impressed. The boss battle in particular made me want to get the full version. I am hoping for some sort of sale down the road though. Is the Demo still available? Do the Demos get..un-available? Yep, the demo's still there for you and Nikki to enjoy! I'm not aware of demos ever being removed. Someone know the answer for sure? Cool reviewski. I just got to the rock and roll world. There are teeny tiny little things that bug me, and the music could be a bit more dynamic and interesting (and that could be said about the game/level design as well) but overall it's quite good. I've only played the demo but I loved it, will definitely be picking this game up at some point, and I'm happy to play $15 for something of this quality ( especially considering I've paid $30 or $40 for retail games with much less content). Thanks guys. Yeah, the price isn't that bad, I think, considering this game could have ended up being more of a full retail release. That makes me wonder if this game had initially been planned to be longer for full retail... I just found it really strange how two of the worlds only have 3 stages each, whereas the others had like 7, 8, or even 9 stages each (including boss battles). I went through those short worlds pretty quickly, and I thought "Is that it?" @roykoopa64 Good point. Those two worlds were so short...and the game did start out as a DS title, I think.